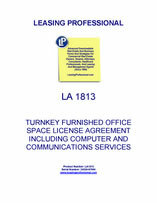 This TURNKEY FURNISHED OFFICE SPACE WITH COMPUTER AND COMMUNICATIONS SERVICES LICENSE AGREEMENT ("Agreement") is made as of the date set forth on Exhibit A attached hereto by and between Technical Provider, Inc., a __________ corporation (the "Company") and Expanding Commercial Group, LLC, a __________ limited liability company (the "Client"). (a) Furnished Office Accommodation: The Company shall provide the number of serviced and fully furnished office workstations in the Company premises for which Client has agreed to pay as set forth in Exhibit A attached hereto (the "Standard Fee"). Fully furnished accommodation includes, but is not limited to, the desk space, chairs, filing cabinets and shelving the Company has designed to accommodate the office including the list of workstations the Company has allocated for Client’s use (the "Office Accommodation"). (c) Conference Rooms & Cafeteria: Client has access to a dedicated conference room to be used in their regular course of business as part of the Office Accommodation. All other conference room use must be scheduled ahead of time with Company’s receptionist. Access and usage of the main conference room and the second conference room will require prior approval from Company which such approval will not be unreasonably withheld. Client has access to freely use the cafeteria and its amenities (microwave, toaster, and refrigerator). Access to coffee, soft drinks and bottled water is considered as Additional Services should the Client wish to use them at an additional cost. The following services may be available for an extra fee in accordance with the Company’s published rates which are subject to change from time to time. The Client’s subscribed to services are defined in Exhibit A. (a) The Nature of Client’s Business: Client shall use the Office Accommodation only for office purposes and only for the business stated in Exhibit A or otherwise only with the consent of the Company. Office use of a "retail" nature, involving frequent visit by members of the public, is not permitted. Client shall not carry on a business which competes with the Company’s business. (b) Client Name and Address: Client may only carry on its business in Client’s name or some other name to which the Company consents. Client shall not display any signs in the Office Accommodation or anywhere else in the Company premises or in the building Client may use the Company’s address as Client’s business address with C/O the Company. (c) Client’s Employees: At the Company’s request, Client shall provide the Company with a list of all of Client’s employees that have access to the Company premises and the Office Accommodation. All Employees will be required to obtain building security ID passes under the Company’s name. Company acknowledges and agrees this list may change from time to time upon which Client will provide an updated list of all of Client’s employees having access to Company premises. (d) Care of Company’s Property: Client shall be liable for any damage caused by Client, or those in the Company premises with Client’s permission or at Client’s invitation, to the Company premises, its equipment, fittings and furnishings. Client may not alter any part of the Office Accommodation without the prior written consent of the Company. (e) Office Furniture and Equipment: Client shall not install any permanent furniture, office equipment, cabling or telecom connections in the Office Accommodation without the prior written consent of the Company. (f) Keys and Security: Any keys or entry cards issued to Client remain the property of the Company at all times. Client shall not make any copies of them or allow anyone else to use them without the prior consent of the Company. Any loss of any keys or entry cards must be reported to the Company immediately and Client must pay the cost of replacement keys or cards and of changing locks, if required. Outside normal business hours, it is Client’s responsibility to lock the doors to the Company premises. (g) Comply with the law: Client must comply with all relevant laws and regulations in the conduct of Client’s business. Client must not do anything that may interfere with the use of the Company premises by the Company or by others, cause any nuisance or annoyance, increase the insurance premiums the Company is required to pay or cause loss or damage to the Company or to the owner of any interest in the building or the property which contains the Office Accommodation. Client acknowledges that (a) the terms of the foregoing sentence are a material inducement to the Company for the execution of this Agreement and (b) any violation by Client of the foregoing sentence shall constitute a material default by Client hereunder, entitling the Company to terminate this Agreement. (h) Comply with House Rules: Client must comply with any reasonable house rules which the Company may impose generally, and from time to time on users of the Office Accommodation whether for reasons of health and safety, or otherwise. The Company may change the house rules at any time at which time Company will provide adequate notice to Client. Client shall not bring animals into the Office Accommodation or to the Company premises. Client shall not play music or use amplification equipment in a way that can be heard outside the Office Accommodation. Client needs to comply with the Company’s and building’s security, fire code and evacuation guidelines at all times. Company will not conduct any activity which may cause a disruption to Client’s intended business as described in Exhibit A and frustrate Client’s use of the Company premises and Office Accommodation under this Agreement. (i) Insurance: It is Client’s responsibility to arrange insurance for Client’s own property which Client brings into the Company premises and for Client’s own liability to Client’s employees and to third parties. Client shall name the Company as an additional insured under its general liability policies and any other person or entit(ies) reasonably required by the Company and deliver a copy of the same to the Company prior to moving into the Office Accommodation.